Poofy Organics. Welcome to my Poofy Party! Welcome to my Poofy Party! Hello Everyone! I am Chelsea Allen and I joined Poofy Organics as an Independent Guide because I am passionate about using organic and toxin-free products that are safe for our health and our planet. Poofy Organics is a small, family owned business that creates certified organic products, made in small batches by hand, that meet the needs of the whole family! There are over 500 products to choose from including luxurious bath and body care, baby care, essential oils, home care, hair care, cosmetics and more! 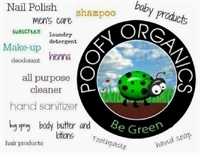 I wholeheartedly agree with Poofy's mission and personally use these products on myself and my family. My favorite thing about them is they are toxin-free, cruelty free, and eco-friendly. I hope you enjoy these products as much as I do!